From a spiritual perspective the fire element represents our passion, renewal, creativity, compulsion and motivation. Fire has great power for foraging will and determination. It is our inner light and symbol of the Divine, that burns in our soul. It is a source of energy that requires moderation and control…or you will get burned. The fire element requires boundaries, so you can tend to it and notice when the coals dim. We all have felt the flames burn in us, be it the soft spoken word, or a gut feeling. We have all, at some point experienced the combustive feeling and magic inside us, protecting us from things that do not serve us or a deeper knowing of what is in alignment for us. Eastern philosophies see fire as forceful and primal. We are of the sun and stars, we are of the fire. It is no coincidence that the Master number 11 represents illumination and insight and corresponds to the element of fire. The number 11 can create wonders or great destruction. It is also the number of spiritual truth and psychic vision. Seeing the destruction and renewal of community in Malibu, is a reminder of how fragile and delicate our environment is and how we can be of service to others and ourselves. Over the years SPIRITUAL KINDLING has set the intention of taking up the fallen and discarded wood and wild brush from fire prone areas and transforming it into a vessel of love and gratitude to be shared with family and friends. Giving the most natural element of fire, connection, family and community. If your hands feel at all creative this Spring – here's a wonderful article posted on ECOSALON's blog . . .
featuring tons of fun, unique & resourceful DIY projects to get you inspired ! "As a long time maker and lover of nature, I often find myself making art and nature crafts from treasures I find in the wild. The flotsam and jetsam of my backyard are some of most inspiring mediums to me. Pieces of bark, dried leaves, fresh mosh, stones, acorns, dried herbs, and more all call out to incorporate them into DIY and arts and crafts ideas. I put together a list of nature-inspired DIY arts and crafts ideas that you can create to add your own brand of nature, design and spirituality to your space." Painted Pebbles – Decorate your stone collection with a paint or a sharpie. 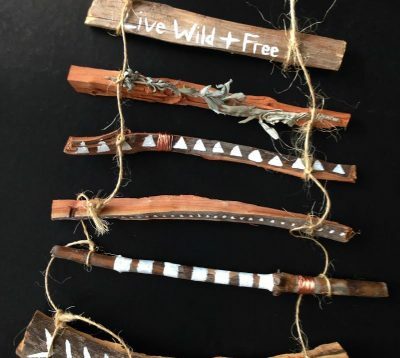 Kindling Wall Hanging – Turn kindling into a spiritual and decorative wall hanging. Tabletop Biosphere – Make and tame your own mini biosphere for a taste of nature indoors. Branch Candelabra – Decorate your next dinner party with some wild abandon. Rainbow Painted Stick Wind Chimes – Create a visual and auditory homage to nature. Painted Stick Love – Turn sticks into a lovely work of art to show that love is all that matters. Painted Stick Mobile – Let your creativity drive you to create a painted stick mobile. Stick Stars – Turn brush into celestial art to decorate your own starry night. Branch and Textile Mobile – Use a branch, yarn and other textiles that speak to you into a hanging mobile. Evergreen Paintbrushes – What a clever idea–use evergreen cuttings as paintbrushes for your next painting project. Branch Weaving – Branches can be used as a loom to create colorful textiles. Branch Wall Art/Room Divider – A practical and decorative natural touch. Flower Petal Sketches – Use flower petals in your next sketches for the ultimate in creativity. Hanging Dried Flower Art – Create a hanging “garden” with dried flowers. Garden Mandalas – Turn leaves, flowers and other natural bits into decorative mandalas. Each year I take time to reflect on the year that has passed. I take into account the struggles and the moments I triumphed when I didn’t think I could. I recall the lessons I have learned, and the habits that did or did not serve me. It’s become a tradition of mine to take a few days to commemorate, as a way of settling the previous year’s affairs and an opportunity to plan and look ahead to the future. Years ago, I was gifted a workbook that has helped me in this process and has since become part of my yearly ritual. encourage an auspicious start to the new year. I would like to share the workbook that I was gifted so many years ago with you! I hope that you enjoy it as much as I do, and that you also form your own tradition of reflecting and dreaming your way into a bright future for yourself! Susannah Conway is an artist, author and teacher who’s been sharing her heart online for over a decade. She helps people trust, know and express themselves better by sharing the tools that helped her heal and live a self-directed life. Her work is steeped in self-compassion, kindness and practicality. Listen and Relax to the beautiful sounds of the Mockingbirds recorded just before 3AM in the canyons of Malibu at our ranch. Mockingbirds are best know for the unusual habit of mimicking the songs of other birds and the sounds of insects and other wild life. Our products ecosystem is supported by the mockingbird and other bird species, sowing the seeds of sage and other important ingredients we gather on our ranch. An enchanting evening with Spiritual Kindling. LOCATION : 1650 Abbot Kinney Blvd, Venice Beach, California. The event will be filled with knowledge based workshops surrounding all elements of our products and ceremonies that you can participate in at home.